HP's trying to make it a little easier to go green with the introduction of its new rp5700. 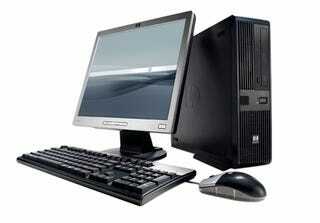 The tree-hugging PC is 95% recyclable, and according to HP it uses 80% less energy than a standard desktop. So what kind of corners had to be cut? Not many. You can configure the rp5700 with a variety of Intel CPUs including a 2.13GHz Core 2 Duo CPU. You can also add up to 4GB of RAM, a LightScribe optical drive, and SATA-based hard drives. Now if only we could do something about its looks. The rp5700 is available today with a starting price of $648.